I want to tell all Veterans "Thank You" for my Freedom. Today our grandchildren have a special program at their school for the family members of the students that are a veteran. Please tell your hubby Thank You! He is my hero! I love seeing that schools are acknowledging the importance of today! 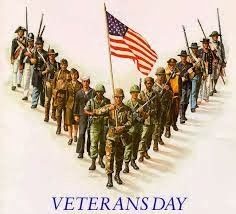 I remember going to school on Veterans Day and having it treated like just another day. I'm happy that schools are now acknowledging this day in a way that the kids will learn to respect service people. Freedom unfortunately is NOT free and the kids need to know this. They need to understand what "The Land of the FREE" really means! That's a cool thing for the school to do!